As leaked by Target last week, Homefront: The Revolution is confirmed for a May 17 release, and there's a new trailer to help you remember. 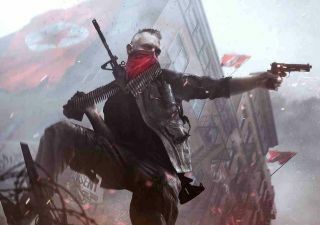 I got my paws on Homefront at EGX last year, and though all the hallmarks of a Ubi-esque open world are there (The Revolution's narrative designer is an ex-Ubisoft writer) there's promise in the concept of guerrilla warfare and being kept on the back foot. It's hard not to think of the Homefront franchise as cursed—it's originator, Kaos, is now closed, THQ with it, and The Revolution's original developer, Crytek UK, was sold off to Deep Silver. It's a relief to know that it will actually release.